Man’s love affair with copper began over 5,300 years ago. That marked the beginning of the Bronze Age. During the Bronze Age, people made tools, weapons and even jewelry from the mix of copper and tin. In the 1800s we discovered an even more important use for copper — as a conductor of electricity. The red metal found a home in every application of a modern society. However, it’s our high-tech future that will bring about a bull market in copper that no investor should miss. The revolution in transportation will need evererything from cars to trucks to trains using more copper. Electric vehicles (EVs) are a rapidly growing segment of autos. Battery packs crammed with copper are replacing aluminum engine blocks. Gas and diesel autos use less than 50 pounds of copper. Modern EVs use over 150 pounds! There are over 3 million EVs on the roads today. The International Energy Agency predicts that this number will swell to over 150 million in just 10 years. It’s not just autos using more of this metal. High-speed trains use twice as much copper than traditional trains, according to the International Copper Study Group. Transportation will become one of the largest users of copper in the coming years. The electrification of transport will have a knock-on effect that will create even more demand. EVs need charging stations. We are already seeing the odd charging station crop up in parking lots around shopping centers. We see them in hotel parking garages. We even see them in some cities. This trend will only increase until these stations are ubiquitous. Analysts expect a tenfold increase in copper demand from charging stations over the next decade. Wires snaking from power grids to parking lots the world over will use millions of pounds of copper. Rising demand is enough reason to be bullish on copper. But there are supply problems that will make this the opportunity of a lifetime. The 2011 to 2016 bear market in copper crushed miners. Copper prices fell by a third from 2014 to 2016. To stay afloat, miners cut exploration and only mined the richest ore. Major miners such as Rio Tinto and BHP Billiton are seeing falling output levels even after billions in upgrades to their mines. 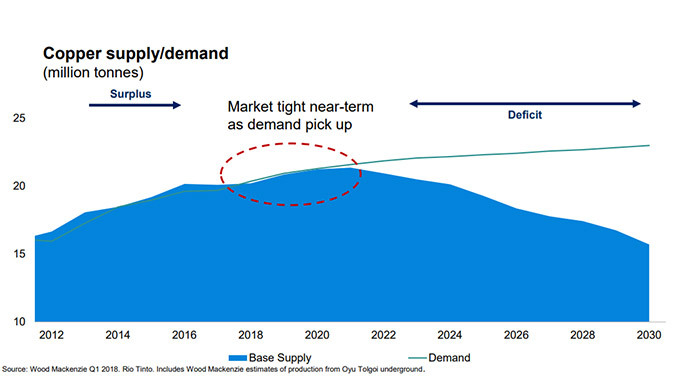 The big problem for copper users is a lack of new projects on the horizon. As prices rise, it will create supply. Lower-price mines will be considered. But new mines take time to build. A mine can take a decade from development to production. In this chart, the solid area is supply. The thin line is demand. As you can see, they diverge in the next year or so. That will send copper prices to new highs. Existing copper miners will see their profits skyrocket. One way to get exposure to this trend is to invest in the iShares MSCI Global Metal & Mining Producers ETF (PICK). This index fund tracks some of the world’s largest copper and base metal miners. In Real Wealth Strategist, we pinpoint the best copper miners. Our readers are up over 30% on their copper miners in the past year!